Hyperpigmentation is a common, usually harmless condition in which patches of skin become darker in colour than the normal surrounding skin. This darkening occurs when an excess of melanin, the brown pigment that produces normal skin colour, forms deposits in the skin. Hyperpigmentation can affect the skin colour of people of any race. Changes in skin colour can result from outside causes. For example, skin diseases such as acne may leave dark spots after the condition clears. Other causes of dark spots are injuries to the skin, including some surgeries. 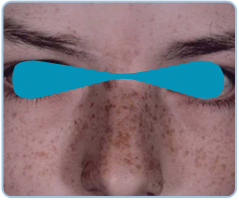 Freckles are small brown spots that can appear anywhere on the body, but are most common on the face and arms. Freckles are an inherited characteristic. Freckles, age spots, and other darkened skin patches can become darker or more pronounced when skin is exposed to the sun. This happens because melanin absorbs the energy of the sun’s harmful ultraviolet rays in order to protect he skin from overexposure. The usual result of this process is skin tanning, which tends to darken areas that are already hyperpigmented. Wearing a sunscreen is a must. The sunscreen must be “broad spectrum” (i.e. it blocks both UVA and UVB). Melanine can be found in the skin, eyes, hair, and even in certain structures of the brain. Melanine in the skin is formed by the Melanocytes via a process called Melanogenesis. The skin is the largest organ of our body. It is made out of three basic layers: the Hypodermis (deepest one), Dermis and the Epidermis (outer layer). The epidermis is itself divided into 5 layers: the Stratum Basale, Stratum Spinosum, Statum Granulosum, Stratum Lucidum and Stratus Corneum. It is in the Stratum Basale (the deepest layer of the Epidermis) where the melanin is formed. The differences in skin colour occur due how active these Melanicytes are, the more active the darker the skin. These melanocytes will activate when exposed to the sun in order to protect the deeper layers of skin and to keep the body from burning. Age or “liver” spots are a common form of hyperpigmentation. They occur due to sun damage, and are referred to by doctors as solar lentigines. These small, darkened patches are usually found on the hands and face or other areas frequently exposed to the sun. Melasma or chloasma spots are similar in appearance to age spots but are larger areas of darkened skin that appear most often as a result of hormonal changes. Pregnancy, for example, can trigger overproduction of melanin that causes the “mask of pregnancy” on the face and darkened skin on the abdomen and other areas. Women who take birth control pills may also develop hyperpigmentation because their bodies undergo similar kind of hormonal changes that occur during pregnancy. If one is really bothered by the pigment, the birth control pills should be stopped. 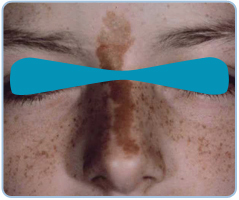 There are various types of pigmentation that occur on the body and face, which can be either congenital or acquired. Causes of acquired pigmentation include photo-damage, hormones, medication, trauma, skin diseases and the natural aging process. There are various ways to remove unwanted facial and body pigmentation, but the method chosen depends on the nature and depth of the pigments. Much also depends on the individual’s skin type, as well as their personal preference. There is no single individual method of removing all pigments; in fact, in many cases, combination treatments are necessary to successfully remove pigments. At the Pulse Light Clinic multiple treatment modalities are available to remove skin pigments. Scabbing is more prominent after laser treatment as compared with IPL treatment. On the other hand, more IPL treatment sessions are needed for the same clearance rate as a laser. However, if the patient requires minimal down time, IPL would be a better alternative because of its less-obvious residual outcomes. Treatment of pigmented lesions on Asian skin is always a challenge. Some lesions will respond to both laser and IPL, yet there are cases where a lesion will respond only to one and not the other. Asian skin is also prone to post treatment pigmentary change and proper skin care is needed before and after treatment to reduce these effects. The main function of melanin is to protect the body from getting damaged by the sun UV radiation. The Melanocytes react to the sun rays by creating melanin. In darker skins the result of this process is the Tan. Lighter skins tend to get red and burn because they do not produce as much Melanine. When over exposure to the sun happens is when you can end up with brown spots and hyperpigmentation as the cells overproduce Melanine. Once this pattern of over production starts it seldomly stops. Injury is the 3rd most common cause of Hyperpigmentation. This happens as a consequence to the inflammation of the skin (rash, bite, acne, trauma, etc). One of the responses of the skin is the inflammation of the Melanocytes which causes an overproduction of Melanie.